Generalization time: many Thai spots in NYC blend together in a haze of generic, undersized storefronts with some variation of the same menu. 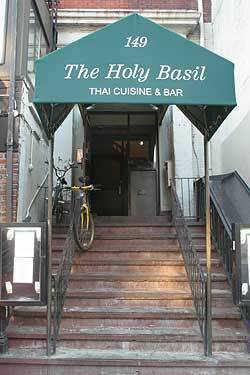 For the last 4 years, I’ve walked past a nondescript entryway labeled “The Holy Basil”, which leads up a staircase, into a building – presumably to ANOTHER Thai resto waiting to be added to my arsenal of the forgettable. Sounds a bit shady, even for this curious foodie – BUT upon hearing from 2 trusted sources that Holy Basil in the East Village (2nd Ave btwn 9th/10th Sts) is a must-try, I decided to give it a go. Once past the entryway sitch, I found myself in an Asian Speakeasy – and not one of those places that is designed to LOOK like a speakeasy; the decor is authentic (makes me wonder if it had another eatery identity in a past life). The music is a mix of swing and up-tempo jazz, the crowd was lively, even at 6:45pm on a Saturday. Normally I don’t eat that early, but it worked out nicely because I got in on the pre-7pm 1/2 priced drinks and we also each received a free salad + spring roll as part of the “happy hour” special. The service was meticulous – our waiter answered all our questions about the menu with enthusiasm – we were never rushed; the pacing was excellent. 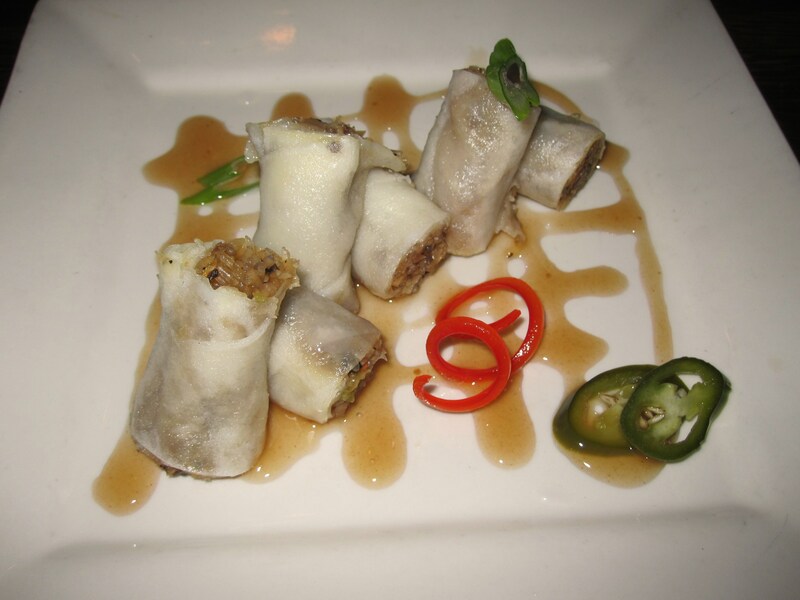 We appetized with Beef Satay, Steamed Spring Rolls and the Papaya Salad. 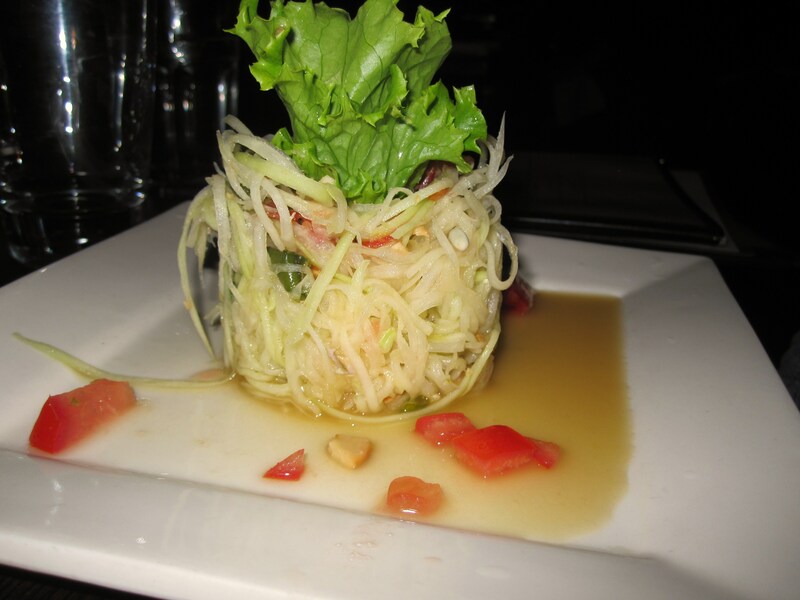 All solid options – of note, the Papaya Salad was spot-on with the traditional Thai preparation of the dish. 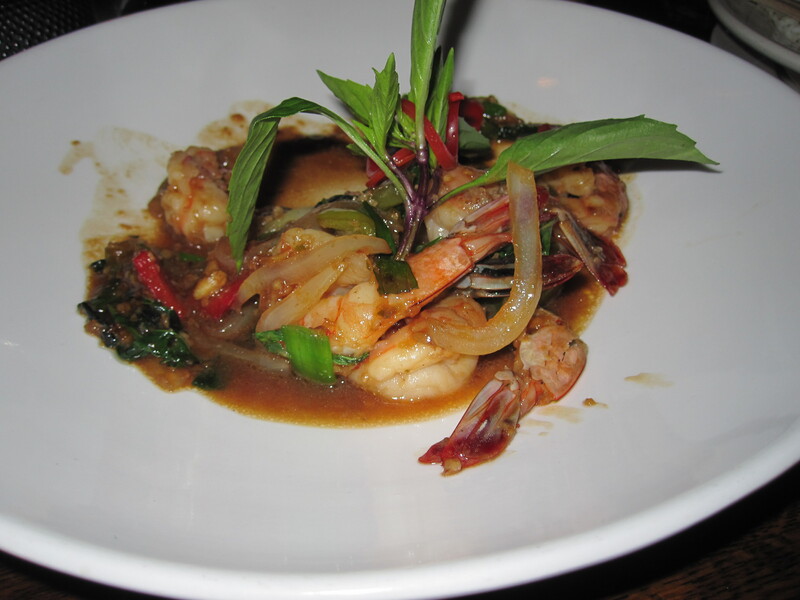 My entrée, the Koong Kaprow – seared shrimp with peppers, onions and the namesake Holy Basil – was divine. 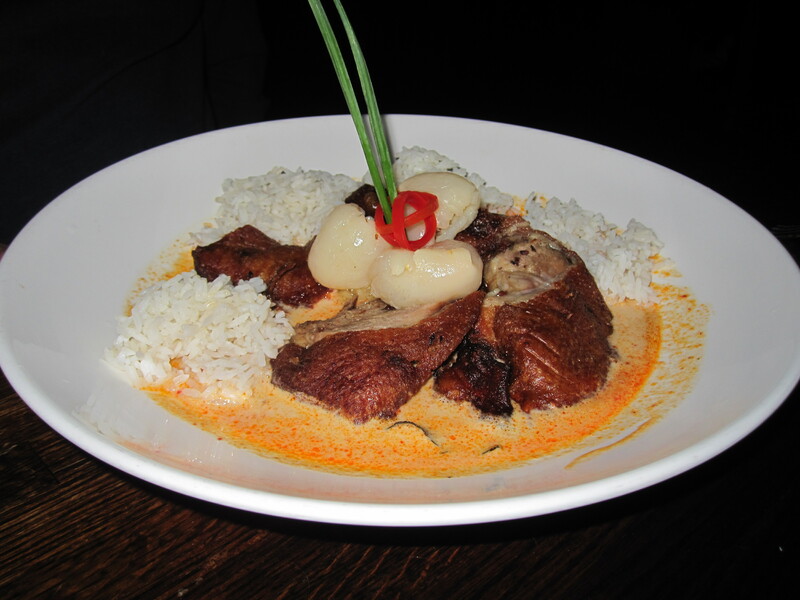 My dining companions went for the Crispy Duck in a red curry sauce w/lychee and pineapple – glowing reviews. If you like it hot, the spiciest menu items have a double-starred (**) indicator, but I could’ve gone even hotter – so speak up if you want extra heat. Everything we ate was legit; like the ambiance there was just an authenticity to the meal. It’s uncommon to enter a restaurant and be completely floored that the space even exists, but walking into this solid Thai resto, I had a total “who would’ve known?” moment… and now YOU know. So if you want a spot with a completely unexpected (and welcomed) vibe, grab your crew and check it out – you’ll soon be a devout aficionado of Holy Basil. The Holy Basil is a great find! I can attest to the Crispy Duck: it was a dream, as well as the Beef Satay (Also dreamy!). Add more stars for atmosphere. A thoroughly delightful experience!